Citation Information: J Clin Invest. 2016;126(6):2093-2108. https://doi.org/10.1172/JCI83792. Immunoscope analysis of Gag293-specific CD4+ T cells. (A) Sorting of Gag293-specific CD4+ T cells with HLA-DR tetramers. Examples of primary CD4+ T cell lines labeled with DRB5 and DR1 tetramers. The percentage of Tet+ cells in the total CD4+ T cell population (middle plots) and in the sorted Tet+ population (right plots) is reported in red. Samples labeled with tetramers loaded with an irrelevant peptide (CLIP or Annexin II [AnnII]) were used as negative controls (left plots). 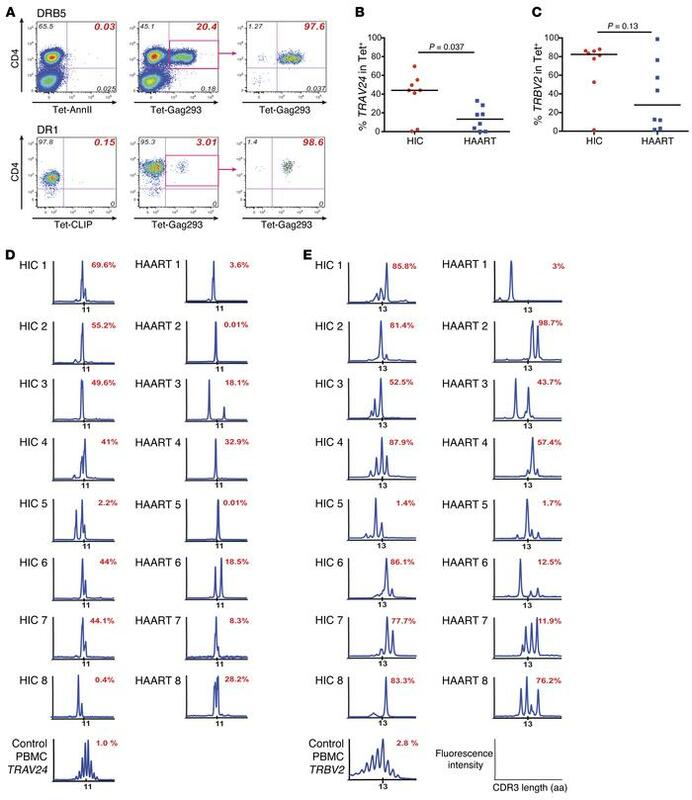 (B and C) The percentages of Tet+ cells expressing the TRAV24 (B) or TRBV2 family (C) were determined by qPCR in the HIC and the HAART groups and compared by using the Mann-Whitney U test. (D and E) CDR3 length profiles for the TRAV24 (D) and TRBV2 families (E) are shown for each patient analyzed. Healthy donor PBMCs were used as controls (bottom left). The percentage of the TRAV24 or TRBV2 family in the total TRAV or TRBV PCR product is reported in red. (B–E) HIC group: n = 8; HAART group: n = 8.